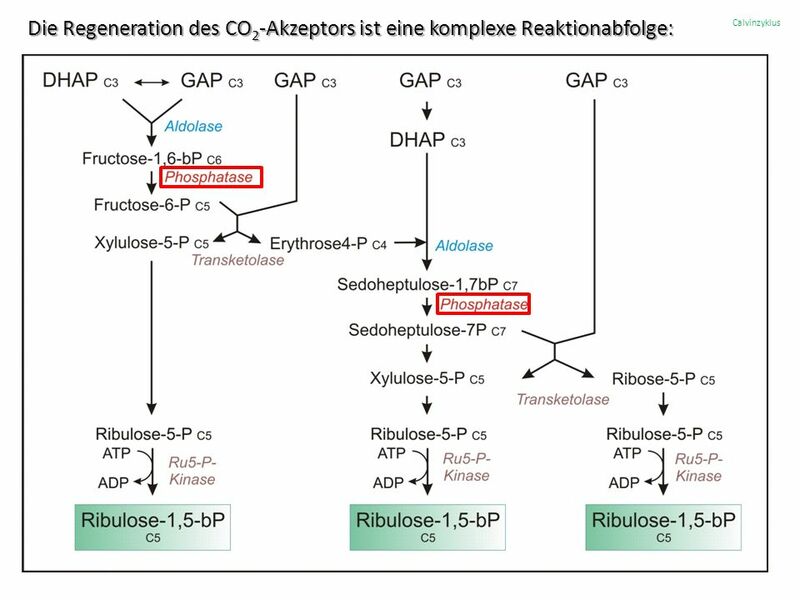 Calcium - Photosynthese Aktivitäten von Kinase Intrathylakiodes Calcium fördert den Photosystem II-Aufbau Aktivität von Phosphatasen: Regenerationsabschnitt. 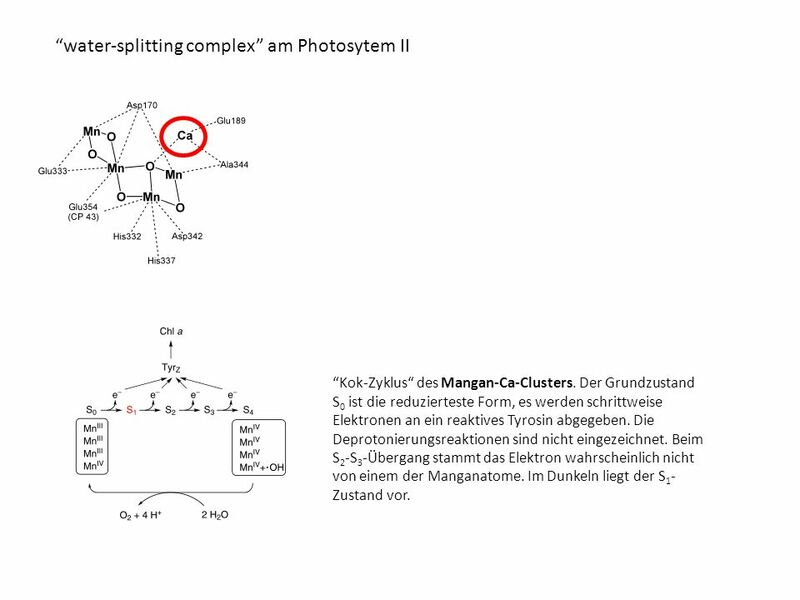 3 “water-splitting complex” am Photosytem II “Kok-Zyklus“ des Mangan-Ca-Clusters. Der Grundzustand S 0 ist die reduzierteste Form, es werden schrittweise Elektronen an ein reaktives Tyrosin abgegeben. Die Deprotonierungsreaktionen sind nicht eingezeichnet. Beim S 2 -S 3 -Übergang stammt das Elektron wahrscheinlich nicht von einem der Manganatome. Im Dunkeln liegt der S 1 - Zustand vor. 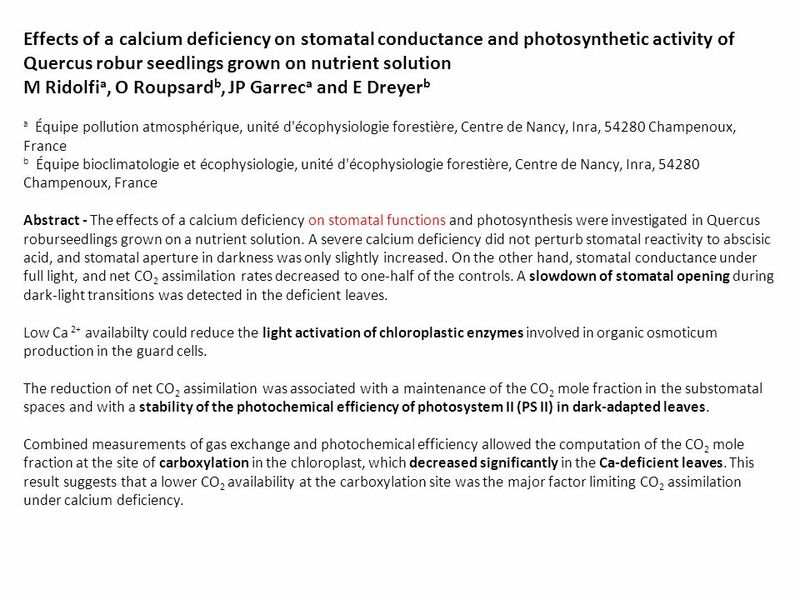 5 Effects of a calcium deficiency on stomatal conductance and photosynthetic activity of Quercus robur seedlings grown on nutrient solution M Ridolfi a, O Roupsard b, JP Garrec a and E Dreyer b a Équipe pollution atmosphérique, unité d'écophysiologie forestière, Centre de Nancy, Inra, 54280 Champenoux, France b Équipe bioclimatologie et écophysiologie, unité d'écophysiologie forestière, Centre de Nancy, Inra, 54280 Champenoux, France Abstract - The effects of a calcium deficiency on stomatal functions and photosynthesis were investigated in Quercus roburseedlings grown on a nutrient solution. A severe calcium deficiency did not perturb stomatal reactivity to abscisic acid, and stomatal aperture in darkness was only slightly increased. On the other hand, stomatal conductance under full light, and net CO 2 assimilation rates decreased to one-half of the controls. A slowdown of stomatal opening during dark-light transitions was detected in the deficient leaves. Low Ca 2+ availabilty could reduce the light activation of chloroplastic enzymes involved in organic osmoticum production in the guard cells. The reduction of net CO 2 assimilation was associated with a maintenance of the CO 2 mole fraction in the substomatal spaces and with a stability of the photochemical efficiency of photosystem II (PS II) in dark-adapted leaves. Combined measurements of gas exchange and photochemical efficiency allowed the computation of the CO 2 mole fraction at the site of carboxylation in the chloroplast, which decreased significantly in the Ca-deficient leaves. This result suggests that a lower CO 2 availability at the carboxylation site was the major factor limiting CO 2 assimilation under calcium deficiency. 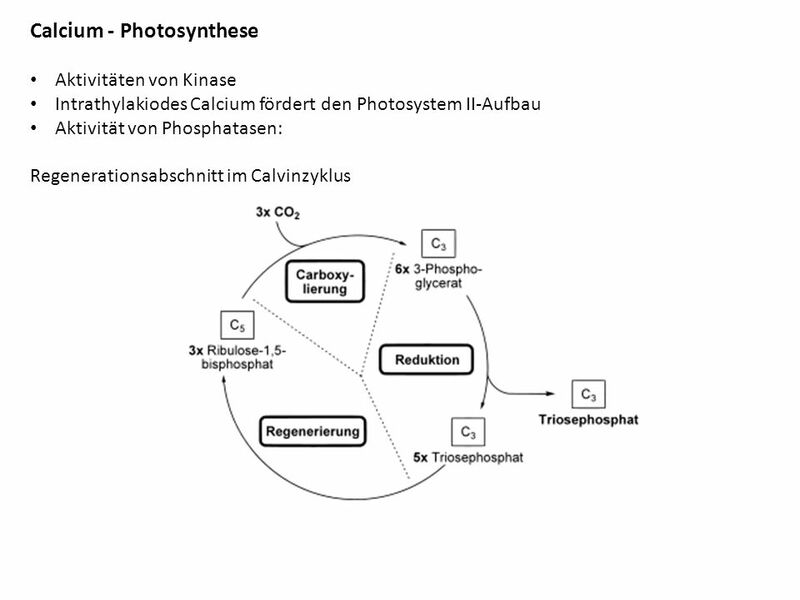 Herunterladen ppt "Calcium - Photosynthese Aktivitäten von Kinase Intrathylakiodes Calcium fördert den Photosystem II-Aufbau Aktivität von Phosphatasen: Regenerationsabschnitt." 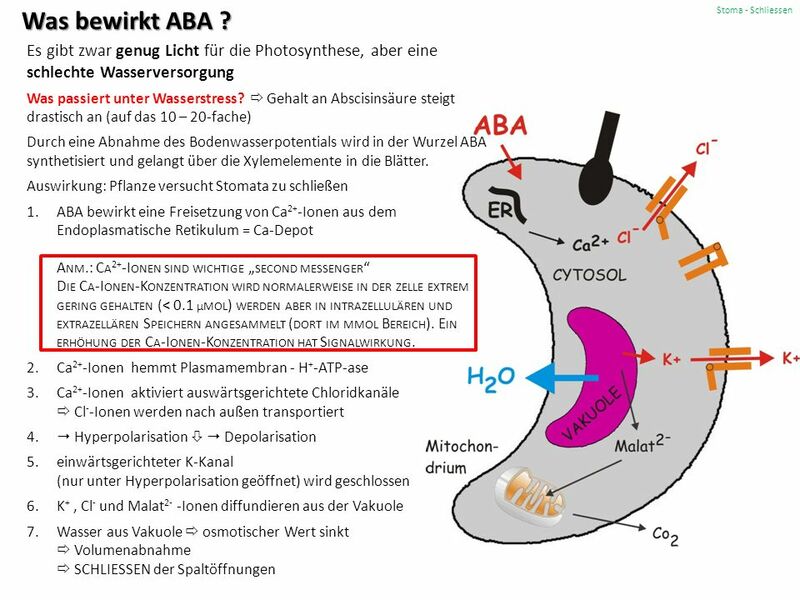 ÜBUNGSZETTEL Aufgabe 1 Welches sind die beiden Endprodukte, die höhere Pflanzen aus der Lichtreaktion beziehen? NADPH/H+ und ATP. Steroidhormone und ihre Rezeptoren Warum wichtig: regeln viele Entwicklungsprozesse und bei Wirbeltieren: Sexualität relevante Prozesse 1.Molekularer Mechanismus.